More than 10.2 million American children have special health care needs, and in the past decade studies have shown that number is on the rise. CNN iReport asked families with children with developmental and physical disabilities to share what their lives are like. Parents painted powerful portraits: of success amid struggle, of growth amid pain, and of the possibility of finding joy and creating new dreams. Five-year-old Remi was never good at keeping himself entertained. That meant work-at-home mom Sabrina Moyer juggled customers' phone calls with mashing Play-Doh and filling in coloring books. The wholesale retailer dreamed of giving her son a sibling – and playmate. But Moyer and her husband, Daniel, had difficulty conceiving another child. After a devastating miscarriage, they at last got joyous news in 2012. At 37, Sabrina was pregnant. She posted the news on Facebook, making it social media official: Remi would soon be a big brother. But everything that could go wrong did. Moyer's immune system crashed. She contracted E. coli and developed gestational diabetes, a form of the disease that occurs for the first time when a woman is pregnant. She bonded with the emergency room doctors in Troy, Idaho, during nine trips to the local hospital during her pregnancy. With her body going haywire, Moyer wanted to make sure her unborn baby was OK. She opted for prenatal screenings to test for a number of disorders, from Down syndrome to spina bifida. Those results came back normal. She and her baby boy, she believed, were in the clear. They decided to name him Colton. On the day of delivery, September 12, 2012, a swarm of doctors and nurses buzzed around her during a planned C-section. Her husband was there, but Moyer needed other comfort when her baby arrived: She didn't hear him cry. American children live with special health care needs. "That was all I wanted. To hear him cry or make a sound, just to know he was breathing." Lying helplessly on the hospital bed, Moyer heard her husband say the unthinkable: "Gosh, I wonder if he has Down syndrome," as he walked over to their son to see why he wasn't making a sound. Moyer shut her dark eyes tight, and said to herself, "No, it couldn't be." The medical team whisked the newborn away to see what was going on. When they returned him to Moyer's arms, she noticed her son's small, soft brown eyes and thin smile. To her, he looked perfect. But doctors said Colton had a handful of markers characteristic of Down syndrome: a thicker neck fold, upward slanted eyes and simian creases on his palms, a single line that runs across the palm of the hand. Although one in 691 babies is born with the condition, making it the most common genetic disorder, Moyer's doctors wouldn't know for sure until they ran a blood test. It would take a week to learn the results. As Moyer and her son prepared to go home from the hospital, a nurse stopped the family to give them a beautiful gift basket. It was wrapped in clear plastic cellophane and filled with books, blankets and toys. Made by a woman in the community who donates gifts to new parents, the basket and its contents were tailored for families who'd just had a child with special needs, the nurse explained. Moyer was hurt. At home, she stashed the basket away on the top shelf of a cabinet. She didn't want to look at it as she began a weeklong wait for Colton's test results. What should have been an exciting time for her and her newborn turned into a stretch of fear and anxiety. In her mind, there was still a sliver of hope. She clung to the results of her prenatal tests, which had indicated that she was way below the threshold to cause any concerns about genetic complications. Only later would she understand the limitations of the screenings. According to the National Down Syndrome Society, prenatal screenings simply estimate the chance of the fetus having the genetic condition. Only after birth can a blood test provide accurate diagnostic results. A flurry of emotions and uncertainty gripped her during those days of waiting. She tortured herself with the same question over and over again: "Why me?" As the days of the week dwindled away, Moyer braced herself for the news. The doctor called on the seventh day and matter-of-factly read the test results: Based on the presence of an extra chromosome 21 in the cells, it was indisputable that Colton had Down syndrome. Moyer felt her spirit deflate. "There was nothing that could have prepared me for the headache, the fear or suffering that would take hold of me when the doctor first spoke those words," she says. Immediately, her mind flashed on questions about Colton's future: Will he be sick? What will happen at school? Will he be teased? The questions came at her like a flood, and instead of swimming, she started to sink. "I spent weeks shouting myself hoarse, screaming, pleading, begging with the air," she says. Moyer grew up in Lebanon, where she says it was typical for families to hide their children with disabilities behind closed doors. They weren't allowed to be a part of everyday life. It was that cultural prejudice that made her fearful of her son's condition. Affects 1 in 691 newborns every year in U.S.
About 400,000 Americans currently living with the syndrome. Average lifespan: 10 years in 1960. Now 47 years. She didn't know anyone who had special needs, let alone Down syndrome. The number of children born with Down syndrome has increased by 31% in the past few decades, from 1979 to 2003, according to a report published in the medical journal Pediatrics. Researchers believe one reason for the rise could be that women are waiting longer to have children. Women over 35 are five times more likely to conceive a child with the condition. Moyer was overwhelmed with guilt about Colton's condition. The couple wanted their son Remi to have a sibling, but "when Colton was born I was like, 'Oh no, Remi is not only an older brother, but also a caretaker now.'" Her fears were compounded when she turned to the Internet to see what it would be like to raise Colton. Her research was marred with unsympathetic statistics about children with Down syndrome. She learned that many children have stunted lifespans, with the mean age being 47 years old, and some have a potential array of health problems like congenital heart conditions, according to the Centers for Disease Control and Prevention. Just as she started to shut herself down in a "dark chamber" to wallow in the loss of her ideal family, Moyer had a moment of self-reflection. Was life really so bad? For two months, she grieved a life she thought she lost, but here was this tiny baby in his crib, laughing, smiling and beckoning her to love him back. The diagnosis does not define your child. She retrieved the hospital gift basket she had tucked away months before and finally opened it. Tearing through the decorative gift-wrapping, she found a short book inside called "Welcome to Holland," by Emily Perl Kingsley. "It's about a trip, your trip. You are traveling to Italy, but the plane lands in Holland instead," Moyer says. "All you wanted in life was to go to Italy, but you realize that Holland is just as beautiful in its own way." 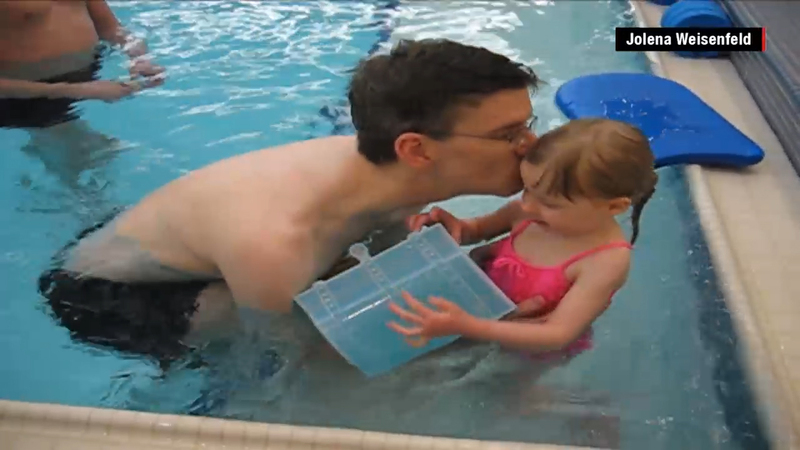 The book, a metaphor for parents confronted with the news that their child has special needs, touched Moyer. Colton is now 2, and his presence has united the family. Their home is livelier than before, and it's constantly filled with the laughter of her two boys. These past two years with Colton have unraveled the dark cloak that Moyer once wrapped tightly around herself. She sees the positives in her life with every advance that Colton makes, no matter how small. She started a website called Special Miracles, which highlights the beauty of raising a child with Down syndrome. She wants new parents to know they aren't alone. Moyer wanted to share her pride in her son and her own personal growth with her father. Like Moyer, he was born and raised in Lebanon and wasn't exposed to children with disabilities. She waited until Colton was a few months old to call him with the news. At first, her father didn't understand because of the language differences. But he realized what it all meant after seeing a photo of Colton on Facebook. He started crying, and told Moyer she should sue her doctor. You've beaten the most frightening monster of all: Your own fears. His reaction stung Moyer, but it wasn't a surprise. "There's a really strong stigma in the Middle East towards people with disabilities," she says, explaining that people, including her father, still use the word "mongoloid," a derogatory term, to describe people with Down syndrome. Her father's reaction resurrected all the feelings of anger and confusion she experienced when she first learned about Colton's condition. But she tried to think about what it must have been like for her father to not have the support of online communities, doctors and nurses, and other parents by his side the way she now did. He needed to find his own way of coping with the news. "I told him, he'll get over the denial period," she says. And, she hopes, he'll learn to see Colton as she does: as loving and full of potential. "Sometimes life just likes to blindside you into oblivion," she says, "and you have two options: Get up, or stay down." Anna Dietzen remembers the smile that stretched across her husband's face when the couple learned they were going to have a boy. Nick dreamed of teaching their son to swing at the golf courses that dot eastern Washington State. Those dreams stopped when the Dietzens were told their son probably would never walk or talk. A rare brain malformation that affects balance and coordination. Affects 1 in 80,000 to 1 in 100,000 children in U.S. every year. Hard to determine how many children have the condition because it's likely to be under-diagnosed. Life expectancy depends on the severity of the disorder. At 7 months, Parker was diagnosed with Joubert syndrome, a rare genetic disorder caused by the absence or underdevelopment of the cerebellum and a malformed brain stem. The condition left him with cognitive impairments and poor muscle tone. Physical mobility is a challenge for Parker, so Dietzen often has to strap him to a high chair while she's cooking to keep an eye on him. That can lead to temper tantrums when Parker sees others moving around freely. After Parker's diagnosis, life became a series of intervention therapies, lab tests and doctors' appointments. But the hardest part for his parents was learning what to expect from their son. "Having a boy, you imagine sports teams and running around," Dietzen says. Two years after Parker's diagnosis, the Dietzens learned they were having a second son. Lane had just turned 1 when they learned that he, too, had the condition. "Our hearts were shattered," she says. "Our dreams of what the future would look like for our children were completely altered." Having two kids with special needs is demanding work. Nick works full-time as a certified public accountant. So every day, Dietzen is the one shuttling their sons to appointments, including physical and speech therapy twice a week and occupational therapy once a week. For a woman who once had a career in sales, Dietzen sometimes feels like a glorified chauffeur. Since neither boy has the muscle development to walk or stand without assistance, Dietzen finds herself doing all the physical work for them. A simple trip to the grocery store can be exhausting. "For me, I have to get out of the car, get a cart, put my kids in the cart, and do it all over again when I get back." We try to raise them as we would any child. Despite the physical limitations, progress is made. Last fall, during Parker's physical therapy, a nurse asked Dietzen to come watch her son through a one-way glass. With her face nearly pressed against the window, Dietzen saw Parker grip the bright red handles of a walker, timidly place his feet on the ground and take his first steps. Her heart pounded with excitement as she watched him drag the walker across the floor while his therapists cheered him on. "It looked like a lot of effort. You could see him breathing hard. He was really holding tightly with his hands," she says. "I had been dreaming about this moment." Up to that point, Parker, who was 3, was still crawling to get around. But the walker gave him freedom to move. That night, she excitedly recalled every detail for Nick. Seeing his son scoot around in his new device inspired Nick to make an unofficial goal to get Parker to walk down the aisle of Nick's brother's wedding. It was just eight months away. The couple shared the idea with Parker as the June wedding date approached, and his face lit up. At the wedding in Pittsburgh, Parker was dressed in a tiny tuxedo. He spent an hour before the ceremony skirting around the venue floor, practicing his walk down the aisle. When it was time for the ceremony to begin, Parker took his place at the start of the aisle, hesitantly looking around at a sea of unfamiliar faces. The day was hotter than anyone anticipated, and people were already starting to sweat. Parker inched forward, but after a few steps he began to cry. "I think he was really overwhelmed," his mother says. Just when she thought Parker couldn't make it down the grass walkway, his cousin arrived at his side, and wedding guests started to cheer. 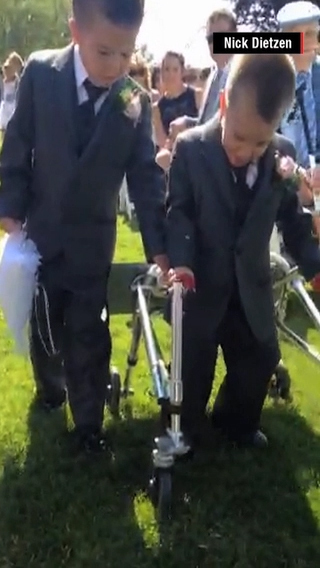 With tears glistening on his cheeks, Parker slowly pulled himself forward with his walker. His mouth agape, he seemed totally focused on reaching the end. By the time he finished walking the 20 feet down the aisle, his mother and father and all the guests were in tears. Nick's brother was marrying an Olympic volleyball player, and many guests were Olympic athletes. After the ceremony, several told the couple that what Parker did was incredible. "It was cool," Dietzen says, "to see people who we look up to as Greek gods say that my son, who has limited muscle definition, was an inspiration to them." Parker's ability to speak and now move freely with his walker gives Dietzen hope that her son Lane will also reach unexpected milestones. 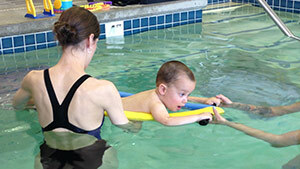 He doesn't speak yet, but at 2 he's already making improvements in his physical and occupational therapy. "I don't take for granted all the things my kids can do. I look at them and I think, ‘You're a miracle.' They are missing a portion of their brain and doing things doctors thought they were never going to be able to do." Lost dreams and unmet expectations are overshadowed now by possibilities. And small triumphs can redefine what life means. Laughter from a child can warm a parent's heart, but for John Weisenfeld it signals alarm. Sometimes the laughter comes in the middle of the night, when he and his wife, Jolena, are asleep in their home in Pasco, Washington. It's accompanied by loud thumping noises or a crashing sound. The couple snaps awake. They know the noise means their 10-year-old daughter is up. Weisenfeld turns over to look at Jolena, hoping she'll get up to calm their daughter. But on this night, it's his turn. He slinks sleepily down the hallway to the bedroom door they keep locked at night to prevent Johanna from wandering around the home at odd hours and hurting herself. Inside, Johanna's eyes are wide. She's propped up in bed, beaming her radiant grin. Weisenfeld joins her, flips on the television and waits. After almost an hour, Johanna falls back to sleep. Weisenfeld creeps back to his bed for a few more hours of sleep. Twenty minutes go by; there's a thump and then giggling. She's up again. Strikes nervous system, causing intellectual disability, severe speech impairment, and problems with movement and balance. Affects 1 in 12,000 to 20,000 people a year in the U.S.
People who are affected typically have no family history of the disorder. The life expectancy for individuals with Angelman syndrome appears to be nearly normal. This is life in the Weisenfeld home. Johanna's sleep disturbances are part of a condition called Angelman syndrome, a genetic disorder that affects her motor skills and makes her excitable and inappropriately joyful. Weisenfeld and his wife first felt something was wrong with their daughter when she was 4 months old. The first-time parents noticed Johanna wasn't able to roll over. Instead of shifting from her back to her belly, the baby would turn onto her side and stiffen up, sometimes jerking her arms. Johanna's lack of mobility worried her parents, so they took her to a pediatrician, who diagnosed Angelman syndrome. The missing chromosome causes lack of speech, motor issues and seizures. A former software engineer with Microsoft, Weisenfeld felt helpless. "For a man like me, you think about how you can fix things." Johanna is accident-prone. She gets her fingers caught in doors, falls down and trips. Stress levels can run high for everyone, especially when Johanna wakes up several times during the night. Weisenfeld didn't know how to deal with the mounting stress at home. His wife suggested visiting the Washington State Fathers Network, a support group for dads raising children with special needs. He shrugged the idea off; he didn't want to go somewhere to talk about his feelings. But as the workload with Johanna increased, and arguments ensued with his wife, he knew he needed help. The first meeting he attended was a picnic in the park. "It was very nonthreatening," he says. But for three meetings he didn't say anything to anyone. It wasn't until he heard another dad talking about his child's sleep problems that Weisenfeld felt a sense of belonging. "Dads need other dads who are solving problems. That's how we are wired," he says. Being among other fathers gave him a new perspective on not only how to care for Johanna, but also how to treat his wife and his younger son Ben. "The most excruciating conversation I have heard is two people with a special needs kid getting a divorce because there were issues that they couldn't unite over. When you hear things like that you think, ‘I need to be kinder to my partner.'" To mitigate the stress, Weisenfeld and his wife split their time with their daughter, especially when it comes to tucking her in at night. It's hard to get Johanna to relax for bedtime. They leave the television on in her room so she has white noise in the background and they tuck her in with a pillow on each side, like she is being swaddled. After being a stay-at-home mom for most of Johanna's upbringing, Jolena got a part-time job at Barnes & Noble so she could get some time to herself. The couple realized it's important for them to each have space. "It rejuvenates her," Weisenfeld says. "She gets some time away, she gets to read books. She feels like this is a very good place from where we have been in the past three to five years." The part-time job also helps offset Johanna's high medical costs. Johanna has Medicaid. That means the family can get reimbursed for any additional out-of-pocket costs for her health. "But when we get a bill in the mail, there's always a drop in your stomach," Weisenfeld says. Raising a nonverbal child can mean more trips to the doctor. "You need to check up and investigate. Any trip to the doctor is a challenge because you can't ask her where she is hurting." Tests can be wrong. Expectations can be exceeded. Who are we to decide what a successful life looks like? It takes roughly $240,000 to raise a child from birth to age 18, according to the U.S. Department of Agriculture. The cost of raising a child with special needs can run double or triple that amount. The Centers for Disease Control and Prevention found in a family survey that 40% of families said having a child with special needs caused financial hardships. "Here's the irony, in order to survive with a kid with special needs you need to be rich or impoverished. There's no middle class," Weisenfeld says. Their family was the former while he worked at Microsoft, but the 80-hour workweeks weren't manageable with Johanna's condition. "We had to go the other route. We had to get money from the state. Without that, we wouldn't be able to make it." Despite marital and financial strains, Weisenfeld, who is now a high school science teacher, says their family has a lot of happy moments. Johanna impresses them all in ways he would not expect. One evening, he watched her walk into the kitchen, find a glass, turn on the sink, get water, drink the water, turn off the tap, and put the glass down. All this without shattering or breaking the glass, which is what she normally does because of her shaky motor skills. "I don't know if she saw me or not, or if that even mattered, but I was so impressed," he says. What might have been an ordinary moment for other kids was a victory for Johanna. Her father found himself wondering: Who is this child? Johanna is an avid swimmer and has an affinity for water. During the summer, she attends a day camp and spends hours in the pool with other kids. 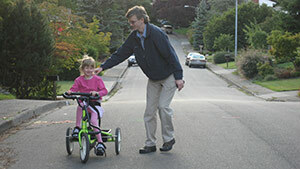 She rides a special tricycle designed for children with balance issues. Weisenfeld and his wife had to fundraise in order to afford it, but it was worth it to see Johanna bike on her own. "Sometimes I wonder if I am selling her short," he says. Small successes make him realize that progress is the goal. "We don't compare her to other 10-year-olds, or other fifth graders," he says, "since that is like telling a fish to climb a tree." One of the biggest things Weisenfeld has learned about himself while raising Johanna is that he's not as patient as he thought. He and his wife sometimes spat over medical bills or needing personal time. But one thing is for sure, he says: "It's OK for one parent to need to check out, but you can't both do it." "There are always problems in relationships," he says. "I've said some things I wish I hadn't, but I know we can handle it all together." "Every person with a 10-year-old is stressed in another way." Months before Tasha Howland found herself checking into a Washington hospital, the 37-year-old was in Iraq working on strategies to train that country's army. As a government consultant for the Pentagon, her life sped forward at breakneck pace. But in 2012, when she was seven months pregnant, it slammed to a stop. Something was wrong with Howland's baby. She felt fine, but her relatively flat stomach made her look like she wasn't through her first trimester. She was thinner than doctors liked, leading them to believe the baby wasn't growing. They weren't able to name the syndrome while she was pregnant, but they knew that something was wrong, and there were multiple anomalies. Doctors told the working mom-to-be that she needed bed rest for the last few months of her complicated pregnancy. At the hospital, Howland learned what bed rest meant: literally staying confined to a hospital bed for two months with an hour of time in a garden every day to break up the monotony. In 40% of families with a child who has special health care needs, a member of the family stops working to become a full-time caregiver, according to a study by the Centers for Disease Control and Prevention. Howland didn't want to join those statistics. "My life always went 100 miles an hour. Being told I would not be able to work meant I would go crazy," she says. At the hospital, Howland worked on her laptop, doing videoconferences about her recent trip to Iraq. "There was nothing I could do about it other than sit still. Someone may have chosen knitting or writing. For me, it was work. It's what kept me sane." She bristled when a colleague asked in a video chat whether she should be working while on bed rest. "I told him my body needed rest, but my mind was fine." Howland and her husband, Dennis, avoided the usual rituals of expectant couples: No announcements, no baby showers. They were afraid: Would their baby even live? Characterized by slow growth before and after birth, intellectual disability, skeletal abnormalities involving the arms and hands, and distinctive facial features. Affects 1 in 10,000 to 30,000 newborns annually. It is expected that most children with the condition will live well into adulthood. Peyton was born during an emergency C-section on July 31, 2012. 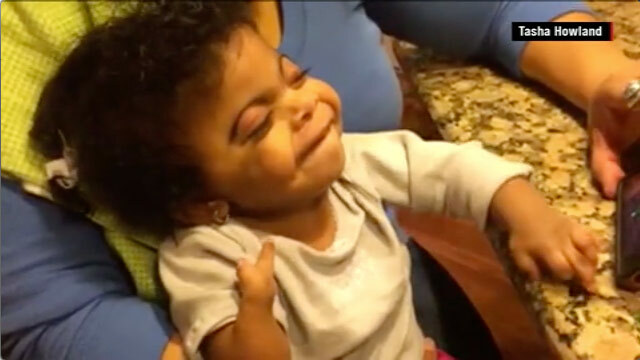 She weighed just 2 pounds and was immediately diagnosed with Cornelia de Lange syndrome, a rare genetic condition that affects mental and physical development and causes intellectual disabilities, distinctive facial features and skeletal abnormalities. Despite the news, Howland and her husband felt relief. Finally, they knew what their daughter was up against. And they knew they could care for her. In the months to come, Howland stepped into the primary role while Dennis, an engineer, worked on contract in Afghanistan. Her days were packed, shuttling Peyton to as many as five doctors a day. Dennis called as often as he could from Afghanistan. Howland struggled to manage her daughter's needs and still find time for herself. In 2013, the new mother hired a nanny whom she taught how to monitor Peyton's health and change her feeding tube. It was Howland's first step toward getting back to a normal routine. By fall, she felt antsy to return to the workforce. She never dreamed of being a stay-at-home mom. She needed the rush, purpose and socialization work offered. In October 2013, she started her first day of work running a cost savings program with the American Red Cross. But that week Howland's nanny quit suddenly, explaining she couldn't take care of Peyton and watch her own grandchildren. Worse, Peyton became incredibly sick with a cold. Howland left work to check on her daughter. Fearful that the mucus buildup around her daughter's tiny nasal cavities would prevent Peyton from breathing, a common problem for children with Cornelia de Lange syndrome during colds, Howland rushed the baby to the hospital. Hours passed as Howland waited to hear from Peyton's doctors. It was midnight when they finally told her they wanted to monitor Peyton through the weekend to make sure her symptoms didn't worsen. Howland slumped back in her seat and stared at her cell phone. She was thinking about what to say to her manager. It was her first week at her new job and already she would have to miss work. The normally confident career woman suddenly felt small and insecure. "I didn't want to be the employee that had a problem because of my kid," she says. "I wanted people to judge me for my work, not because of my kid's health." To her surprise, her manager and co-workers completely understood. "They were like, ‘Go take care of your daughter.'" When Peyton was discharged from the hospital, Howland decided to work mostly at home. She set up an office in the basement and her parents came up from Florida for five months to help out while Howland searched for another nanny. She's still just a kid. She loves hugs and music and smiles just like everyone else. She stopped into the office once a week to stay connected with the people she worked with. But working from home helped relieve the stress of trying to do it all. She could take her daughter to therapies and doctors' appointments and not feel the guilt of leaving work early. "It's different working in the office and people seeing you always leaving for something as opposed to working from home and getting things done without being judged," she says. There was a lot of joy at home, too. Howland loves being there to see Peyton's accomplishments, which happen sometimes randomly throughout the day. Though Peyton needs a feeding tube to eat, Howland watched one morning as she ate a spoonful of yogurt by herself. 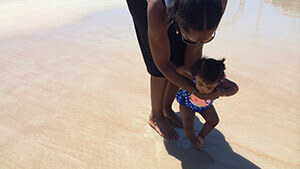 It was a huge deal -- a milestone the working mother didn't have to miss. Now 2, Peyton can't walk, and her development is slow, but she has a bubbly personality. She likes to play musical games on Howland's smartphone and enjoys spinning around on her swing. Dennis returned home from Afghanistan at the beginning of this year. The best-paying engineering job he could find was in New York. He commutes home two hours every Friday evening and travels back to work on Mondays. Howland says the distance has created some loneliness for both of them. She has hired a new nanny to watch Peyton while she works from home, and sometimes feels the urge to spend time with the nanny for the sake of companionship. The couple's multiple-city lifestyle has also affected the way they spend time together. They've sacrificed holiday plans, weekend trips and date nights because both are often exhausted from the long hours of working and commuting. "We try to do date nights on Saturday," she says, "but it doesn't always work out." Their career decisions -- putting their jobs first before their relationship -- are motivated, Howland says, by their love for Peyton. It's their way of ensuring she will be well cared for financially if something happens to them. Cindy Colwell, 42, is a mother of three kids and caring for one of them transformed her into an advocate. 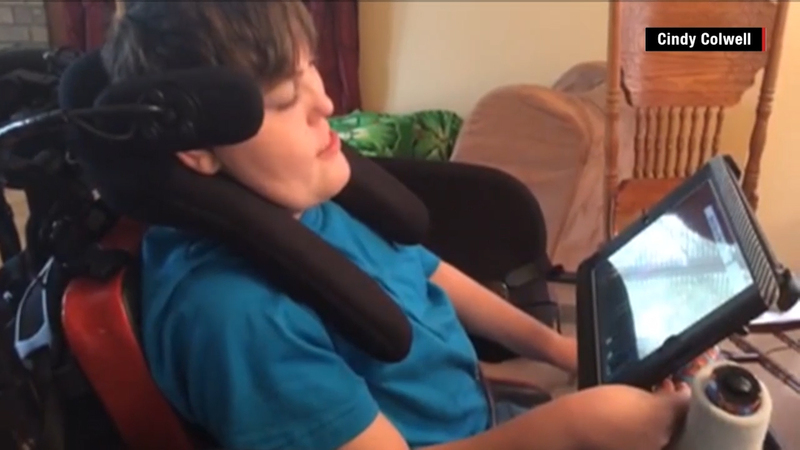 Her 11-year-old son Wyatt, a sixth-grader in Colorado Springs, Colorado, was diagnosed at birth with quadriplegic cerebral palsy, a condition that affects all his limbs. Raising Wyatt helped Colwell discover a new identity. In this letter to her younger self, she shares her life lessons with other parents starting their own journey with a special needs child. Finding out you're going to have twins is an indescribable moment. But nothing -- not even life itself -- prepares you to hear that there's something wrong with your babies. Most common motor disability in childhood. Affects 1 in 323 children. Cerebral palsy refers to a number of neurological disorders that start to show at early childhood. Spastic quadriplegia is the most severe form of the condition and often occurs with moderate to severe intellectual disability. That is what is going to happen to you. You'll learn something is very wrong with your twin boys. You'll feel overwhelmed bringing Evan and Wyatt home from the hospital. They'll need a lot of care. At first, there will be no time for anything else but taking care of them and Gabby, your energetic 4-year-old. There will be a lot of crying -- from the newborns and from you. It will be difficult to embrace this new life because it is not the one you were expecting. No one imagines having two babies with so many health issues. But one of your boys will get better, and the other one will not. In the next 11 years, there will be countless surgeries and long hospital stays. There will be many discussions about how one twin will have tremendous special needs while the other one will grow up healthy and normal. Doctors will tell you that Wyatt has severe microcephaly, a genetic abnormality that damages the development of the brain and the shape of the skull. You will learn this when he is 4 months old. When he is 1, you will learn he also has cerebral palsy. Doctors will tell you he will need a wheelchair and a feeding tube for the rest of his life, and that he will have limited vision and may never speak. All these things will paint a very dark picture of Wyatt's future. Worse, you will come way too close to losing him more than once. But know that as 11-year-olds, both Evan and Wyatt are happy. You will throw yourself into the world of parenting a child with special needs while still being a parent to your other two children. Don't worry about your other kids missing out on so much because of the time you devote to Wyatt. Gabby and Evan will grow up in a way that makes them more caring and compassionate. Best of all, they will see their brother as just another kid. Your life will not always be easy. There will be years of therapy, surgeries and hospital stays. Frustrations will flare. Wyatt will scream because he can't communicate his wants and needs verbally. This is not the life I would have chosen, but most of the time I am happy. But one day, Wyatt will speak, just not in the traditional way. With an electronic app, he will finally be able to tell you how he feels with a computerized voice. Through that piece of technology, you'll discover he has a dry sense of humor that can bring a classroom to roaring laughter. He'll show you he's smart and strong and with opinions of his own. He will exceed the expectations you once had for him, the ones you formed when all you were being told was what he wouldn't be able to do. And then one day, he'll say, "Mom, I love you." It will not be in his voice, but it will be his words. He will open a whole new world to you. In this journey, you will meet strong parents who will support you. You will learn to research and ask tough questions. You will open your mind to alternative treatments for Wyatt. For years, you will try to get other people to see your son as a real person, the way you and your family see him. I am not sure, though, if other people will ever change. Just because their body does not work does not mean they do not understand everything going on around them. But through all of this, you will set aside your fears. You will not be the shy person you once were, who wanted everyone to like her. You will grow to have a stronger, louder voice that advocates a better quality of life for your son. You might not realize it now, but through your advocacy and education you will help new parents who are raising children with special needs the same way other parents long ago supported you. One day, you will find yourself standing in front of a group of people and you will be telling them the difference they can make in their children's future. No, this isn't the life you expected. But this new life will be full of love and laughter, and through that you'll rediscover happiness with your family. Are you raising a child with special needs? Join the conversation and tell us what it's like for you. Jack Barr Jr. had a panic attack when he found out his daughter had Down syndrome. Harrison Golden's father lost his smile to Bell's palsy in January 2001. Golden, then 9, vowed never to smile in solidarity with his dad. When Will Bruce killed his mother, he believed she was an al Qaeda agent. After seven years in a psychiatric hospital, he is taking his first steps toward freedom.